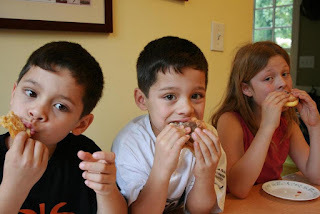 My second post has been published on the Creativity for Kids blog! It's all about saving money on summer camp fees by organizing your own camp with a group of friends. I've done several "Cousin Camps" with my sister, her sister-in-law and all our kids and it has been a blast for everyone. Now that my sister is back in Manila, she will be sorely missed, but Curatrix and I can still get our kids together this summer... Cousin Camp must go on! Medicine cabinet or liquor cabinet? Last week I had a doozy of a cold; I spent several days suffering from a sore throat, runny nose, hacking cough, buzzing ears and aching head. I know cough and cold medicines don't really help with the cold, but they sure do a heck of a job with the symptoms, so every night I took a dose of NyQuil. Who wants to cough throughout the night when you can take some vile tasting cherry-vanilla flavored liquid and conk out? On average, beer contains 5-7% alcohol. Wine contains 10-15% alcohol. 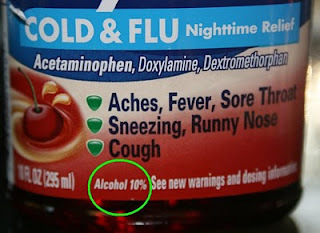 And this cough syrup has 10%. WOW. I get tipsy with just a couple of sips of wine. 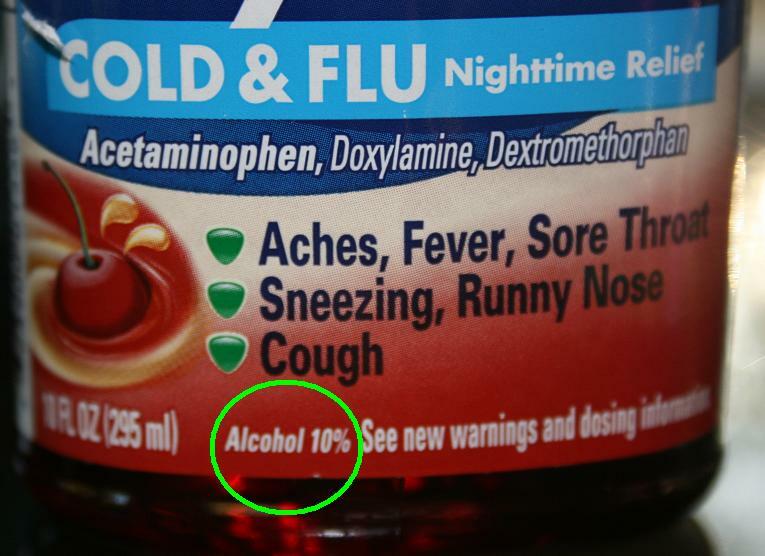 No wonder NyQuil knocks me out at night! I'm this week's Creativity for Kids blogger! A couple of weeks ago Alfie pointed to the kids' window art and asked why I hadn't taken it down yet. "Christmas is over, shouldn't the decorations go back into storage?" "No, dear," I said patiently. "That's their window art. That stays up permanently." I know this stuff looks out of place in a Craftsman home, but hey, it's also a home with kids, and I think the window art gives our back entrance a warm, whimsical feel. I even wrote a post about how much I love them over at the Creativity for Kids blog, where I'm the Featured Blogger of the week. Check out my post, and don't forget to take a peek at my bio, which has my awesomely cute baby picture (garish 70's jumpsuit aside) and some funny facts about me. I think I've figured out a way to cure childhood obesity. All you have to do is build all elementary schools on steep hills, put all the classrooms at the top of the hill, and put the parking lot, playground and cafeteria at the bottom of the hill. At least that's what it felt like a couple of weeks ago, as I was trudging up the slopes of Roosevelt Elementary School with a huge box of Leapfrog Tag readers and books. I was delivering the Tag Reader classroom kit that Leapfrog gave me to donate to a kindergarten classroom as part of their Tag. Give. Read. program. My friend's sister-in-law teaches fourth grade at this school, and she introduced me to a lovely kindergarten teacher named Jennifer, who was delighted to receive the donation for her students. 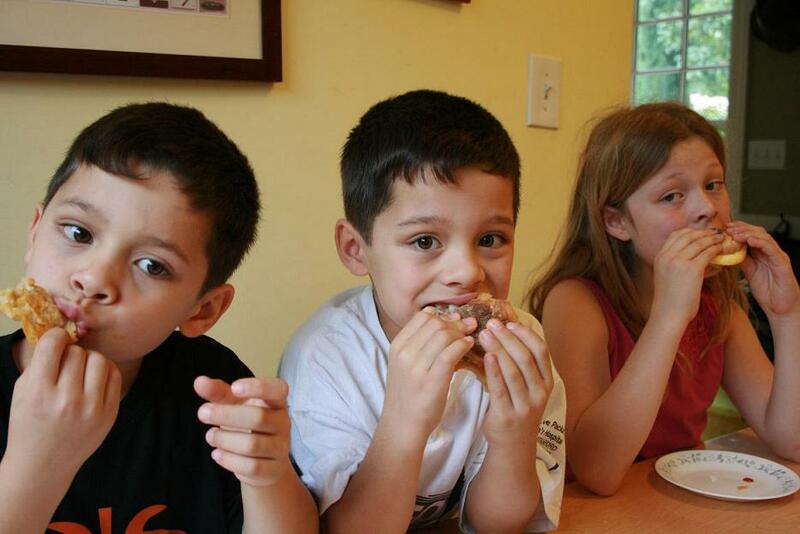 When I was pregnant with the twins, I craved meat. I cringe to admit this, but for the first four months of my pregnancy I ate a McDonald's Sausage McMuffin every day for breakfast and a carne asada burrito every day for lunch. Ahhh, those were the days. Now I have no excuse to head to McDonald's and our local burrito shop every day, but I still occasionally get that craving for animal flesh. Since I'm currently participating in BlogHer's Jimmy Dean D-lites program, Jimmy Dean sent me some coupons for free samples of their new Jimmy Dean D-lites breakfast sandwich, and I have to say their microwaveable Turkey Sausage Muffins are a great way to tame those breakfast meat cravings. It's made with whole-wheat muffins, reduced-fat turkey sausage and egg whites so it's a healthier product, but it still tastes terrific. Ask my kids. Or try it yourself -- the BlogHer Jimmy Dean page has a link to a $1-off coupon, and links to 25 $100 giveaways so you can win the cash to stock up on your own Turkey Sausage Muffins. Good luck! Disclaimer: I received coupons for free samples of Jimmy Dean D-lites from Jimmy Dean and BlogHer. Last week Alfie banged his head on a door and split his forehead open. The only kind of bandage we could find was a bright yellow Spongebob Squarepants Band Aid. He almost didn't want to go to work the next day because of it. Yesterday I attended my first Zumba class. For those of you who aren't familiar with Zumba, it's a cardio workout based on dance steps and music, mainly from Latin America. During the hour-long workout, we danced to salsa, merengue, cumbia, reggaeton, samba and hip-hop. It was smooth. It was hard-hitting. It was sweaty. It was shoulder-shaking, hip-swinging, shimmy-shaking fun! This morning I finally took our van in to check on a faulty automatic rear door. This has been a problem since mid-November, but I've procastinated -- and endured a month and a half of opening and closing the cargo hatch by hand (ugh, whatever did people do before remote controlled doors?) -- because I was dreading the cost of fixing it. $250? $400? Ugh. Man, it's such a bummer to realize that your once-cool-and-spiffy van is now seven years old, and starting to show signs of its age. What finally broke down my resistance was just that: a breakdown. Or rather, an almost-breakdown. We were in Reno, and the car refused to start. Luckily, after a couple of frantic tries, it started, and we were able to get home, but a week later the battery was completely dead. We had to buy a new one. We figured the battery had run down because the kids are perpetually leaving the inside lights on, but we decided to have the van checked out to make sure the charger was working properly.